David Michael Blatt is a professional basketball coach and a former professional basketball player born on 22nd of May 1959 in Boston, Massachusetts USA. He is currently the head coach of Darussafaka of the Turkish Basketball Super League and Euroleague. 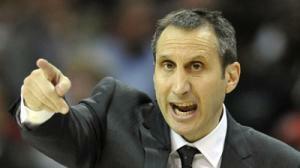 Have you ever wondered how rich David Blatt is? According to sources, it has been estimated that David Blatt’s overall net worth is $9 million, acquired initially by professionally playing at various basketball teams in the US and Israel, and later by building a successful coaching career. Since he is still an acknowledged basketball coach, his net worth continues to increase. David was raised Jewish and attended a Hebrew school twice a week until his bar mitzvah. As a teenager he attended Framingham South High School where he played basketball, and later, during his studies at Princeton University, he played as a point guard with the Princeton Tigers, and was also the team captain. He was soon recruited to play in Israel in his second year, then Blatt also played in the Maccabiah Games for the US national team that won a gold medal in 1981. Upon graduating with a BA in English literature the same year, David moved permanently to Israel, and continued playing in Israel’s Super League for the next nine years – for Maccabi, Hapoel and Ironi – until an injury led to his retirement as a player, and led him into his full-time coaching career. His net worth was already well established. David first became assistant manager for Hapoei Galil Elyon, but became the head coach by the middle of the season. During the next, 1994-95 season, Blatt became Pini Gershon’s assistant, and won the Israeli “Coach of the Year” title in 1996. In the following years, apart from continuing to coach Hapoel Galil Eylon, David became assistant coach of the Israeli National Team, and also coached the Russian National Basketball Team for six years from 2006, winning the EuroBasket 2007. Blatt moved to Maccabi Tel Aviv for the 1999-2000 season during which his team won Israeli League and Israeli Cup and finished second in the Euroleague. In the following years, David recruited some foreign players to the team, and Maccabi won one Euroleague title, won the SuproLeague in Paris and reached the finals of the Adriatic League. In 2002 he won the Israeli “Coach of the Year” title again, and was named Maccabi’s head coach. Two years later, Blatt signed a contract as head coach with Dynamo Saint Petersburg in Russia, and won the FIBA EuroCup with the team later that year, earning the “Coach of the Year in Russia” title for the 2004-05 season. His net worth was growing steadily. During the following seasons, David was appointed head coach of the Israeli National basketball team, Benetton Treviso in Italy, the Russian national basketball team, Efes Pilsen of the Turkish Basketball League, and Aris Thessaloniki of the Greek League before moving to Maccabi Tel Aviv once again. Leading the Russian national team to a bronze medal in the 2012 Olympics was one of his bigger career achievements. In 2014, after his contract ended, Blatt left Maccabi Tel Aviv in order to seek an NBA position, being hired as the head coach of the Cleveland Cavaliers in June the same year, a team which he later led to the NBA finals. Upon his signing with the Cavaliers, he was named Euroleague Coach of the Year. In April the following year, David earned his first Eastern Conference Coach of the Month award. When it comes to his latest ongoings, Blatt was named the head coach of Turkish club Darussafaka in the Euroleague in June 2016. In his personal life, David has been married to Kinneret Blatt since 1991, and the couple have four children.